Circling Themselves To Death : Krulwich Wonders... Bad things happen when blind ants follow other blind ants — especially when the leader veers away from food. But if a few hundred of these ants starve to death does anyone notice? A couple of months ago we explored this question: "Why Can't Humans Walk Straight?" This month, I'm revising the question for ants, because ants have a more serious problem. Why, I wonder, do some ants fall into circles that never end, causing them to starve and eventually die? Circling in humans is a modest puzzle. Circling in ants raises more profound evolutionary questions. But when the lead ants start to loop, bad things can happen (and remember we humans loop too, we can't hold a straight course over long distances without external points of reference). If the ant-in-front loops and intersects with its old trail, the whole crowd then turns in on itself and everybody gets caught in the endless circle. This behavior was first described back in 1944 by Theodore C. Schneirla of the American Museum of Natural History. He called it "circular milling" and pointed out that ants get stuck in ways that we humans never do. YouTube has a cool computer simulation from user "1314kimo," that shows how these things get started. If you watch it a couple of times you can find the "lead" ant inadvertently causing the trouble, but the 'leader' isn't a Napoleon type commanding the troops;she's an accident. Her 'lead' role seems entirely random; one moment she's moving along behind some other ant, then she just steps into a gap at a random moment, turns and without intention, the Death Spiral begins. It's an odd phenomenon, but the more interesting question — from an evolutionary point of view, is why haven't ants over time learned to Un-spiral? Alex Wild, the photographer biologist whose blog, Myrmecos, I'm paraphrasing here, points out that getting into circular death traps is not exactly the best way to get your genes into the future. But apparently these army ants haven't learned to do that. 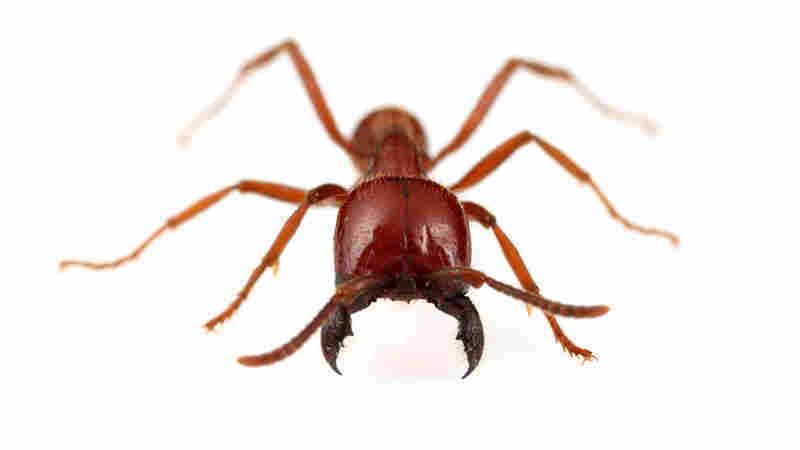 "[A]rmy ant colonies are huge, their daily intake immense, their fecundity explosive. A few hundred spinning workers lost around the margins may not make all that much difference [to the survival of the colony]." Oh. So if every minute a few hundred ants starve to death going round and round on pavements and dinner plates (Alex says he's seen that happen — on plates in his own kitchen in Paraguay), Mother Nature isn't going to notice or bother. The odd thing is, for some reason...I notice and I'm bothered.